Fishing your lure too fast is the number one mistake that bass anglers make. Yes, it is possible to get a reaction strike doing this if you’re lucky, and there are some lures that require a faster retrieve, however, for the vast majority of lures and fishing situations you are better off working it slow and being patient. Too fast of a retrieve can generate short strikes and pulling your lure in too quickly and not letting it sit or sink long enough can spook an interested bass. Also don’t overwork your lure. We all know that guy who will jump a worm around like he’s spelling his name with sparklers on the fourth of July. One of the primary reasons pro anglers are just so much better than us average Joe’s is because they have pinpoint accuracy with any rod, from any angle, and their lure just drops into the water like an Olympic diver, no splash. Pinpoint accuracy plays a huge role in fishing success when you think about it. Fish, particularly bass, almost always relate to some sort of cover, structure, or drop-off which is exactly where we as anglers target them. We spend a lot of time taking our boats miles across the water to the best fishing spots only to end up two feet short because we cast like our Grandma with a bad elbow. Fish aren’t going to go out of their way to take your lure, so casting quietly and accuracy is key. Practice in your backyard, it will pay off. I am as guilty as the next guy for doing this. It is so easy to blame the lure when you’re not getting fish, but rarely is that the problem. About 95% of the time it’s not that they don’t want your lure, it’s an issue with something else; action, speed, noise, casting accuracy, fishing location, time of day. As fishermen we assume it’s the lure though and go ahead and keep changing it hoping something else will work. Sometimes you will get lucky, but the problem here is that constantly switching lures reduces your fishing time with a line in the water and it really doesn’t accomplish much. Next time you think about changing lures, consider changing something else first. Bass can hear very well and there are many anglers have spooked fish they never even knew were around because they were talking, laughing, banging their boat, or knocking a paddle. Don’t think this is true? Sound travels over four times faster in water (3,170 mph) than in air (740 mph), it is louder, and it goes further due to the denser medium. Think about this next time you’re out fishing and throw a huge rainbow cast that lands with a big plop. Bass will run from a sloppy and loud splash that lands close by and you will completely miss out on some solid fish. This one is easy to address, use a smaller hook. Almost no one uses a hook that is too small, it is always that the hook is too big and causes the bait to look unnatural, it gets noticed by the bass, and it hurts the lure action. Also just because you’re using a wide gap worm hook doesn’t mean it has to be enormous. I have personally caught several four to five pound bass while fishing for panfish with a size #1 hook. Bass can and will see a hook that is too large and they will swim right past it. If you’re not familiar with hook sizes check out our hook section. Also, don’t be that weird guy who uses the wrong hook. A very common mistake newer anglers make is to avoid cover. 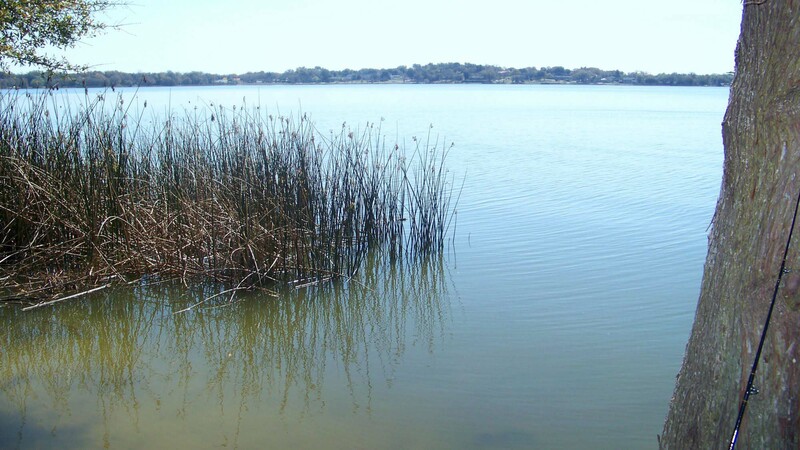 They’ve heard that bass will be hiding there but they don’t want to get hung up on lily pads, submerged logs, or dock pilings and lose their new lure, so they avoid them like the plague and head for open water. This is a huge rookie mistake. Fish almost always relate to cover or structure and they are about 100 times more likely to be found there than in open water. Admittedly if you cast to cover you will lose a few lures, but you will undoubtedly hook more fish. When choosing line a lot of fishermen will opt for a line that will cover all situations since most of us don’t want to carry spare spools or change the line all the time. While this does make sense, you are putting yourself at a disadvantage if you think there is a single line for all situations. Too thick of a line diameter will greatly impact that action that you can give to your lure while too thin of a line will increase your break offs. There are also changes in line needed in regards to your lure. A topwater lure will benefit from a more buoyant line such as braid, while a deep diving lure will be better with a sinking line such as fluorocarbon. Line can absolutely make a difference. I was fishing off of a house boat one evening with friends on a lake in Kentucky with very clear water. We were all using the same bait but I had 10lb fluorocarbon compared to everyone else with 20lb braid. At the end of the night I had landed several white perch, catfish, and panfish while everyone else had been skunked. All this being said, if you’re not going to switch your line based on the lure, at the very least use an appropriate leader size for the fish you’re going after. It can be a hilarious to watch your friends set a hook on a bass. Some will go to one extreme and throw their back out and whip the rod over their shoulder to set the hook, others will barely even raise the rod tip before they start reeling. A lot of how you set the hook depends on what line you’re using, how much of it is out, and what hook is being used. The reason you see some people set hooks so aggressively is because they are using a line that stretches, such a monofilament, and there is a lot of it out. The other reason is because they’re just obnoxious. The violent hook set is needed in this case since the line stretches when it sets and ultimately the amount of pressure on the mouth of the bass is much less than the whip-like action you see occurring on land. On the other hand, when using a static line such as braid or fluorocarbon you should not be using such a wild hook setting action unless you want to rip the lips off your fish. Braid just requires a purposeful and sturdy set to deliver the same pressure to the mouth of the bass and set the hook. Also always remember that you don’t ever want to set a circle hook with the rod. Instead reel in all the slack and just keep the rod tip up. Whether it be lack of attention, inexperience, or a windy day, slack in the line can cause you to injure or lose your fish. If you’re using a J hook and a bass swallows your lure before you feel it then it is very likely to become gut hooked which usually results in the fish not surviving. Also slack in the line lets a bass take your lure and run with it which gives the fish time to realize it’s not real and spit it before you can set the hook. The only time you would ever want to have slack in the line is when you’re using circle hooks with a natural bait. In this case you want the fish to pick up your bait and swim off before reeling in the slack and lightly setting the hook. Rods – Wipe down occasionally with a damp paper towel. Check the eyelets for bending and any cracks in the ceramic rings. Clean the cork handles as needed to prevent cracking. Reels – Rinse with fresh water after each trip. After a few trips open up the reel to grease and lube all the metal and moving parts including bearings. Hooks – Keep hooks clean to prevent rust. Test for sharpness before each trip and sharpen as need so it grabs your fingernail when pulling at a 45 degree angle. Line – Keep an eye out for nicks or abrasions on your line. To extend line life you can re-spool it in reverse. Also use a line conditioner to make it last longer. When we go to Bass Pro there are so many awesome lures to choose from, but the problem is they are all marketed to appeal to humans. Rather than picking lure colors that appeal to you, try to pick ones that will appeal to the fish based on your fishing conditions. Sometimes fish will hit almost any lure regardless of color; however there are some solid guidelines to lure colors based on water clarity and weather. 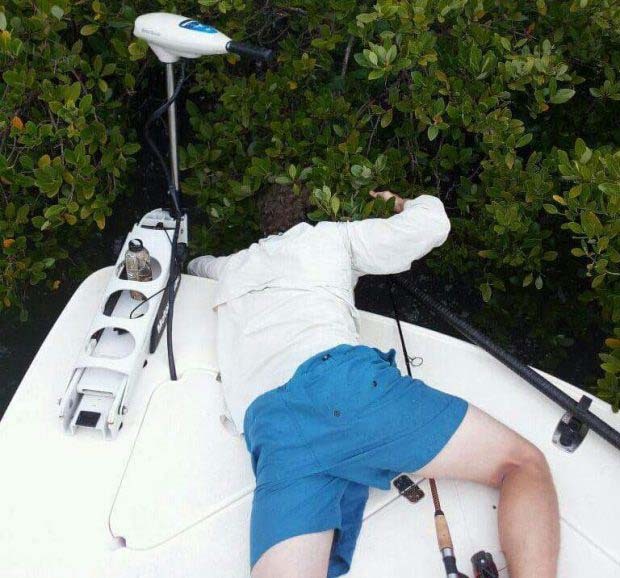 We all make mistakes at one point or another while fishing, but whatever you do, try not to end up like this guy.